Centro de Investigaciones en Enfermedades Tropicales (CINTROP) and Centro de Investigación en Biomoléculas (CIBIMOL), Universidad Industrial de Santander, Bucaramanga, COLOMBIA. Introduction: There are not effective drugs available for treatment of dengue fever despite intensive research on synthetic inhibitors. The search for active phytochemicals could serve for the discovery of new drugs. This study aims to evaluate the antiviral activity in vitro of compounds found in essential oils from medicinal plants. Materials and Methods: Nine synthetic-derived essential oil compounds were evaluated. Antiviral effect was screened measuring the reduction of viral NS1 and E proteins in HepG-2 and Vero cells. Results: β-Caryophyllene was identified as the most active compound, it reduced the virus serotype-2 replication in HepG-2 cells at IC50 of 22 ± 5.6 μM, and blocked replication of all four serotypes in Vero cells at IC50 between 8.0 μM and 15.0 μM. The selectivity indexes were between 5.3 and 10. According to results from time-in-addition assays, the antiviral effect of β-caryophyllene appears to be associated with interruption of early steps of the virus life cycle. Citral revealed modest antiviral effect, it reduced the virus serotype-2 (IC50 of 31 ± 4.5 μM) replication but not the other three serotypes. Seven terpenes did not reveal antiviral activity at maximum concentration of 30 μM. Conclusion: Research on compounds found in essential oils can contribute to the drug discovery effort for dengue. β-Caryophyllene could serve as a starting point. Flechas MC, Ocazionez RE, Stashenko EE. 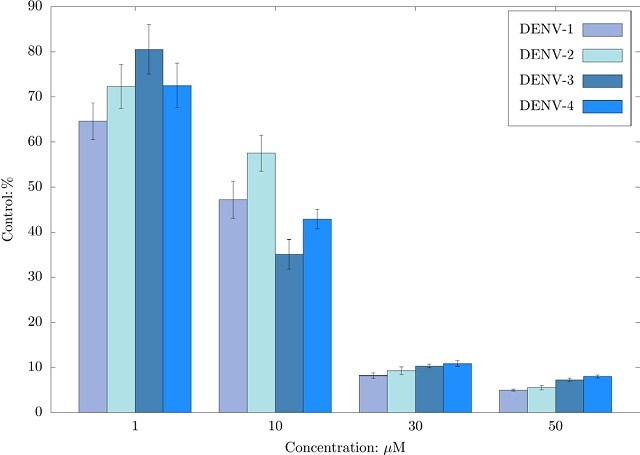 Evaluation of in vitro Antiviral Activity of Essential Oil Compounds Against Dengue Virus. Pharmacognosy Journal. 2018;10(1):55-59.